After being quiet for the whole 2017, MyPhone suddenly announced a new device device for those who wanted a photography centric smartphone for less, the MyA10. The MyPhone MyA10 is one of the few to feature a "dual camera" setup at this price point. It has an 8MP Sony primary sensor paired w/ another 2MP depth sensor for deeper background blur or bokeh effect. However, it only features MediaTek's MT6580 quad-core chip that has no ability to maximize the potential of the dual camera setup. Other than that, it also has 5.5-inch HD IPS screen, 1GB RAM, 8GB expandable storage, and big 3,500mAh battery. This phone also has WiFi, 3G, Bluetooth, GPS, A-GPS, and dual SIM slots. It boots w/ Android 7.0 Nougat as well. 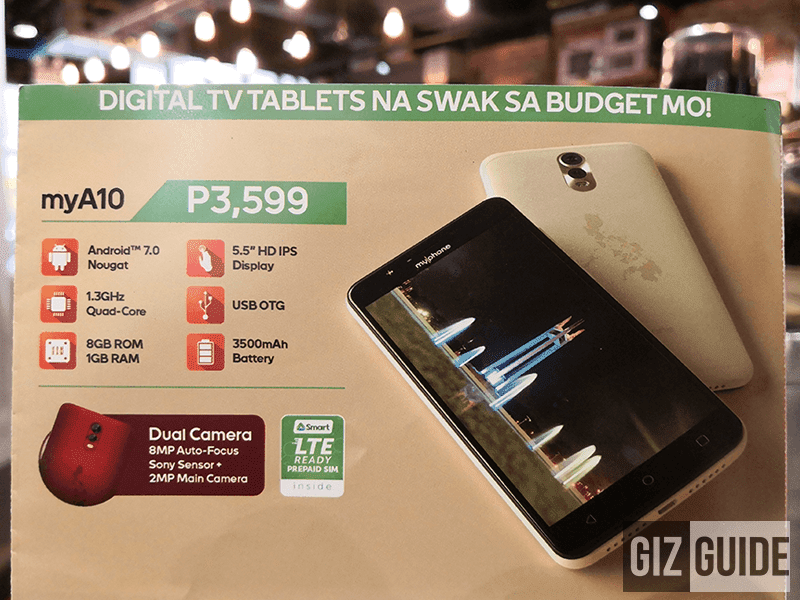 The MyPhone MyA10 is priced at PHP 3,599 only. It'll also go w/ FREE Smart LTE SIM inside.